Can families root out Poverty? This piece first appeared inThe Herald (Port Elizabeth) on 8 December 2010. 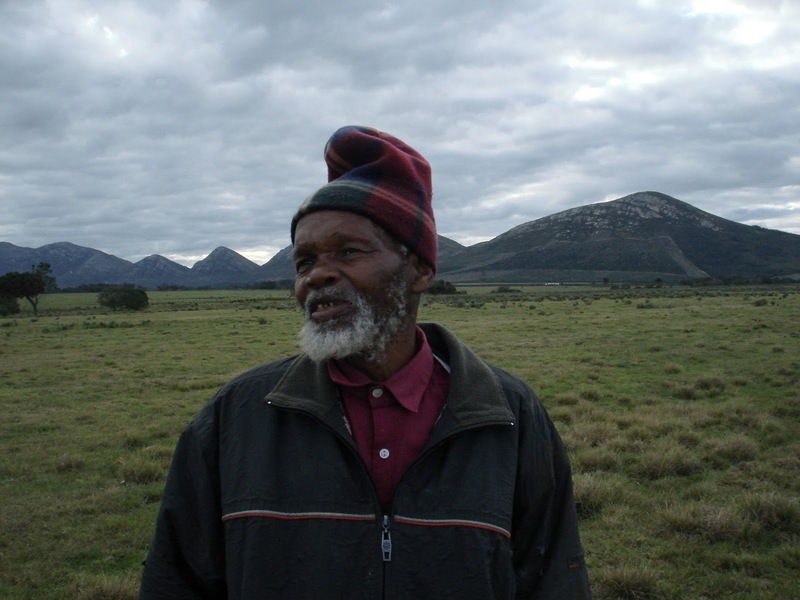 Nguni Matroos, the one armed geriatric Tsistikama farmer,…an inspiration! Minister Ebrahim Pattel proposes that the salaries of the rich are frozen. While it is easy to see how this move would score points with the labour movement, the Minister has not argued how this limitation will address the challenge of poverty. We speak a lot about poverty in South Africa.y, rural poverty, “endemic poverty”, “entrenched poverty”. In talking, we have almost abstracted poverty; elevated to the status of an issue. Something requiring the world’s attention like global warming or rain forests. But how much do we really know about poverty? We think we know what poverty is. Surely the answer is obvious. But is it? South Africa like other developing countries are today the front-line, we are at the battlefront of the war against poverty. Here, poverty is real, tangible and palpable. This is not the case in Japan, New Zealand or Sweden. Our friends in those countries can be forgiven for assuming and arms length theoretical view of poverty. But for us in Africa, we have got to develop an understanding of poverty useful enough, to use to take action. Poverty is a problem effecting real people with real lives. I have slowly begun to grasp that we often think of poverty as the “inability to consume”. We think that poverty is simply that we haven’t got enough stuff or the money to buy stuff. But I wonder if it would not be better to understand the “inability to consume” rather as the symptom of the problem we are trying to solve. Would it not be more useful for us to see that it is the continued inability to produce and be productive that is the root of poverty? Much of poverty is caused by ordinary people being robbed of their ability to be productive. This robbery has been carried out in the name of colonialism, apartheid, crime or capitalism. Government’s welfare and housing programme’s are addressing the fallout from the robbery. They are to be applauded for this effort. But, does a social grant and an RDP house stop poverty? Is a poor woman still poor the day after she moves into her new RDP house? Yes. Of course. She is simply a poor person sleeping under and asbestos roof. For us to take this woman out of poverty, we need to find out what stands in the way of her being productive. This is where it becomes difficult for government. It is impossible for government to go door to door, intervening at a household level . Government is doing what governments must do. Government have cemented our macro economic fundamentals and they have put in place safety nets for those that are too sick, too old or too young to look after themselves. So if the institution of government cannot root out poverty at the household level, which institution can? This is where I propose, for discussion, that we do not overlook the family as an “institution”. The family institution has real power and it has broad reach. A family has the ability to identify those of its members who are victims of poverty. If it is not your sister, it may be your cousin, if it not your cousin it may be your second cousin. Extend definition outward from the core as far as you need to find a member trapped in poverty. Once we find this person, I suggest we get personally involved; understanding what obstacles this member faces to being productive. Remember we are trying to help this person to take the first step out of poverty. To earn even R1000.00 a month may revolutionise this family member’s life. What blockages stand in the way of your family member growing chickens? Selling firewood? Making vetkoek? Mending dresses? Painting houses? Growing pumpkins? Washing sheets? Baking Bread? Don’t be cynical or patronising. Remember obstacles that may seem small to you could seem insurmountable to them. Once you agree on the project, help unblock the blockages. It may require a small cash loan, it may require some advice, it may need you to assist with an alcohol addiction, you may need to fence in the chickens to keep the neighbours dogs out. Each situation will be different, but know that you are the best placed person to help. One by one, family by family poverty slowly begins to withdraw to be replaced by a generation of productive, efficient and competitive families. Could this be the path we should walk? Let us discuss it. Previous Previous post: Work for All?